The Stock Management provides a database of all the merchandise items the enterprise is dealing with. The window(fig 4) gives the usual aspect of the two other ones. To ensure some standard of documents layout, the input fields are generally truncated at defined length. Code 6. (Your code reference.) letters are also allowed. The button 'Listing' will provide the stock value with the category and flags filtering. The automatic '#' flag warns you that the minimum has been reached. The Supplier reference in an item data is used the verify the matching when you fill an order document to a supplier. 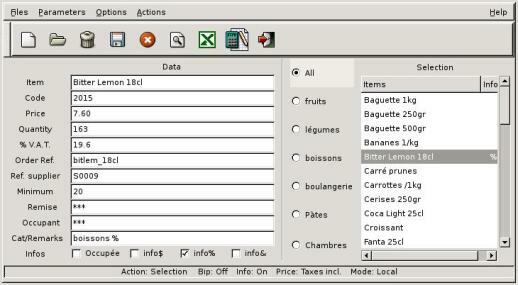 Selecting an item within this window will make its data available for both Customers and Suppliers managements. Via the Menu/Parameters it is possible to initialize the letters A B C D with VAT values. These letters are then usable in the %VAT field. As the codes are freely assignable, a history of the new assignments is available from menu > File > Listing.